This disclaimer ("Disclaimer", "Agreement") is an agreement between Roy Barnett ("Roy Barnett", "us", "we" or "our") and you ("User", "you" or "your"). This Disclaimer sets forth the general guidelines, terms and conditions of your use of the https://www.guitar-skill-builder.com website and any of its products or services (collectively, "Website" or "Services"). 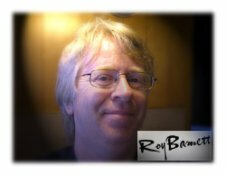 Any views or opinions represented in this Website are personal and belong solely to Roy Barnett and do not represent those of people, institutions or organizations that the owner may or may not be associated with in professional or personal capacity, unless explicitly stated. Any views or opinions are not intended to malign any religion, ethnic group, club, organization, company, or individual. You may not modify, print or copy any part of the Website. Inclusion of any part of this Website in another work, whether in printed or electronic or other form, or inclusion of any part of the Website in another website by embedding, framing or otherwise without the express permission of Roy Barnett is prohibited. This Website accepts forms of advertising. Advertising space will always be identified as such. Some of the links on the Website may be "affiliate links". This means if you click on the link and purchase an item, Roy Barnett will receive an affiliate commission. While we have made every attempt to ensure that the information contained on the Website is correct, Roy Barnett is not responsible for any errors or omissions, or for the results obtained from the use of this information. All information on the Website is provided "as is", with no guarantee of completeness, accuracy, timeliness or of the results obtained from the use of this information, and without warranty of any kind, express or implied. In no event will Roy Barnett be liable to you or anyone else for any decision made or action taken in reliance on the information on the Website or for any consequential, special or similar damages, even if advised of the possibility of such damages. Information on the Website is for general information purposes only and is not intended to provide legal, financial, medical, or any other type of professional advice. Please seek professional assistance should you require it. Furthermore information contained on the Website and any pages linked to from it are subject to change at any time and without warning. Any of the information we collect from you may be used to personalize your experience; improve our Website; process transactions; run and operate our Website and Services. Non-personal information collected is used only to identify potential cases of abuse and establish statistical information regarding Website usage. This statistical information is not otherwise aggregated in such a way that would identify any particular user of the system. These terms and conditions ("Terms", "Agreement") are an agreement between Roy Barnett ("Roy Barnett", "us", "we" or "our") and you ("User", "you" or "your"). This Agreement sets forth the general terms and conditions of your use of the https://www.guitar-skill-builder.com website and any of its products or services (collectively, "Website" or "Services"). This Agreement does not transfer from Roy Barnett to you any Roy Barnett or third-party intellectual property, and all right, title, and interest in and to such property will remain (as between the parties) solely with Roy Barnett. All trademarks, service marks, graphics and logos used in connection with our Website or Services, are trademarks or registered trademarks of Roy Barnett or Roy Barnett licensors. Other trademarks, service marks, graphics and logos used in connection with our Website or Services may be the trademarks of other third parties. Your use of our Website and Services grants you no right or license to reproduce or otherwise use any Roy Barnett or third-party trademarks. To the fullest extent permitted by applicable law, in no event will Roy Barnett, its affiliates, officers, directors, employees, agents, suppliers or licensors be liable to any person for (a): any indirect, incidental, special, punitive, cover or consequential damages (including, without limitation, damages for lost profits, revenue, sales, goodwill, use or content, impact on business, business interruption, loss of anticipated savings, loss of business opportunity) however caused, under any theory of liability, including, without limitation, contract, tort, warranty, breach of statutory duty, negligence or otherwise, even if Roy Barnett has been advised as to the possibility of such damages or could have foreseen such damages. To the maximum extent permitted by applicable law, the aggregate liability of Roy Barnett and its affiliates, officers, employees, agents, suppliers and licensors, relating to the services will be limited to an amount greater of one dollar or any amounts actually paid in cash by you to Roy Barnett for the prior one month period prior to the first event or occurrence giving rise to such liability. The limitations and exclusions also apply if this remedy does not fully compensate you for any losses or fails of its essential purpose. You agree to indemnify and hold Roy Barnett and its affiliates, directors, officers, employees, and agents harmless from and against any liabilities, losses, damages or costs, including reasonable attorneys' fees, incurred in connection with or arising from any third-party allegations, claims, actions, disputes, or demands asserted against any of them as a result of or relating to your Content, your use of the Website or Services or any willful misconduct on your part.